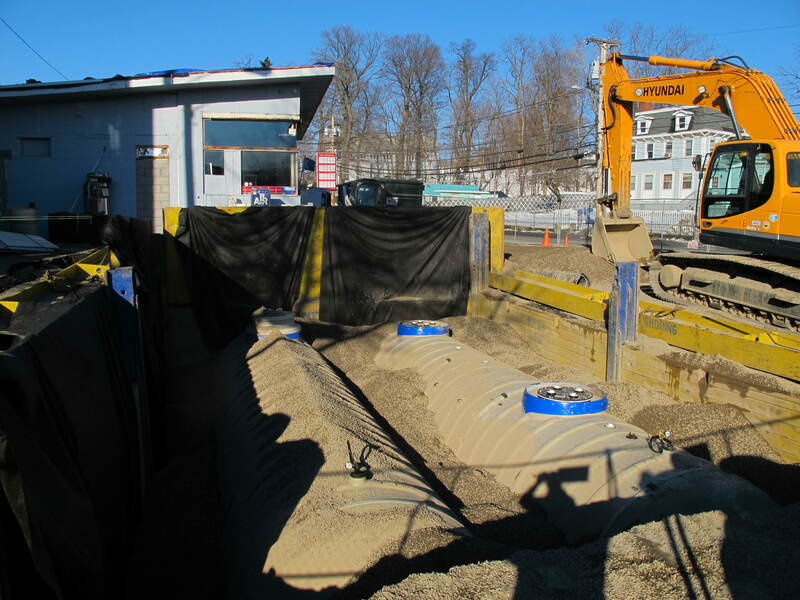 City regulations specifically prohibit enlargement of structures containing nonconforming uses, but the Xtrafuel gas station at Main Street and Fishkill Avenue is expanding nevertheless. The site plan is still up for public discussion. However, the building inspector has interpreted the zoning in a way that would allow the owners to add an additional 200 square feet of space. The logic used not only stretches the boundaries of reality, but it goes against the very essence of the new Central Main Street district zoning objectives, as well as the letter of the law. Ironically, when the zoning was passed in 2013, the inspector was one of its biggest cheerleaders. The nonconforming use of a building or structure may be continued, provided that: (1) Such building or structure shall not be enlarged or extended unless the use therein is changed to a conforming use. 1. The plans note that the site is located within the CB Central Business District. However, the site is located within the CMS Central Main Street District in which gasoline filling stations are a prohibited use. Section 223.10.C(1) of the Zoning Law states that the existing, nonconforming use of the building may be continued, provided that the building is not enlarged or extended, unless the use is changed to a conforming use. Therefore, the building cannot be enlarged given the existing, nonconforming use. Obviously, in addition to prohibiting expansion, the city does not want a nonconforming use to undergo the type of gut renovations that would allow it to increase its worth or ability to continue the nonconforming use, thus allowing it to further thrive into the future. No brainer, this one’s in the bag. Beacon Planning Board 1-13-15 from Peter Skorewicz on Vimeo. First of all, if it smells like gas, leaks gas, and sells gas, it’s a gasoline station. In the last 25 years, how many gas stations in the United States have been constructed without a mini mart component? Long gone are the days when you pulled up to a “gasoline filling station” and were greeted by a smiling attendant who came out from under a car wiping his greasy hands on his overalls and started to clean your windshield and check your oil. Beer. lotto, and cigarette sales are de facto included in the definition of filling station these days. To claim otherwise, that this is some unique exception, is disingenuous. When a customer fills up her tank and goes into the building to pay retail for the gas, a nonconforming use is being conducted in that structure. It does not matter what other transactions may take place (although judging from the size of the new underground tanks that just went in, the cash register is ringing up a lot more gas sales by volume than beer or milk). Regardless, it is irrelevant what percentage of the sales are “non-conforming.” You can’t be a little bit pregnant or a little bit non-conforming. There is no justification for making a determination like this, it’s wrong. Obviously this decision has further ramifications. Now the other two gas stations in this district are free to expand, since those entities, like just about every gas station now in America, sell chips, too. All the drive-through Suds car wash has to do is install a gumball machine and they can magically transform into that mystical creature, conforming/nonconforming. Dave’s Auto next to Homespun? Section off part of the garage and sell cupcakes and voila! Dave’s can exist into eternity. Why bother writing a new zoning code if we’re going to ignore it? You can’t section off parts of a building, or pieces of a parcel, and claim some of it is conforming and some of it isn’t. That is spot zoning on steriods. The goal is not to stretch the imagination to the breaking point in order to find some purported loophole for a private concern, the goal is “to bring about the gradual conformity of the uses of land and buildings” into compliance with the wishes of the community. As the building inspector knows, the Central Main Street district was designed as a form-based code, meaning that the setbacks and the relationship of the buildings to the street is of foremost importance. In other words, not only is the letter of the law being circumvented here regarding nonconforming use, the interpretation is also in direct opposition to the spirit of the new code. The Xtrafuel cinderblock structure is out of compliance in every dimension possible. Why contort the situation in order to promote and succor something that, from every conceivable standpoint, is not allowed? A use, as well as a dimensional layout that, through its elected officials, the community has determined goes against the well-being of the economic, social, physical, and aesthetic aspects of the city, and is actively trying to phase out? Nonconformity other than use. A building that is conforming in use but does not conform to the height, yard, lot area, lot dimension, land coverage, off-street parking, loading, minimum house size or similar dimensional requirements of this chapter shall not be considered to be nonconforming within the meaning of Subsections C, F and H. No permit shall be issued that will result in the increase of any such nonconformities, except that each side yard of the aforementioned lots may be reduced by one inch for every foot that such lot is less than the minimum width required by this chapter. Some may wonder why this is so important. After all, they are only asking for a 10′ x 20′ walk-in cooler. But if moving all the cooler storage into the new space gives them 200 square feet of additional retail, that is a significant boon. And because the gas station suppresses the kind of walkable streetscape that enhances economic vitality, the expansion of this enterprise comes at the expense of the surrounding businesses, businesses and structures that are in compliance and do not destroy the streetscape. Put another way, the gas station is making money at the expense of the surrounding businesses. If you have doubts about this, think of how often you see pedestrians or cyclists along the swath of Route 9 in Wappingers that consists of one strip plaza attached to the next. The three filling stations on Main are little pieces of those strips spliced into the center of our town, and the curb cuts, building setbacks, and deference to the automobile they demand definitely impacts walkability. Less walkability for a non-strip mall business means less revenue. If Beacon is to truly become a walkable, more economically viable city, as per the comprehensive plan and the new zoning codes, it must eventually phase out the huge disruptions created by the gas stations. Right now about the only tool we have to accomplish this goal is to enforce the zoning clauses that restrict expansion of non-conforming uses. It is in fact why the code was written as it is. It is paying close attention to these seemingly small matters that adds up over time to achieve the goal of gradual conformity. Here is a golden opportunity to potentially make some headway at a significant site on Main Street. There is no need to interpret this section of the zoning code. Both the particulars and the general intent are clear, and the regulation forbidding expansion of a nonconforming use should be enforced. The applicant is asking that the planning board make a determination to count the spaces in front of the pumps as parking space. And why would the board want to do that, exactly? How would this help it move the city toward conformity, one of the planning board’s most important directives? Where this chapter requires a greater width or size of yards or other open spaces or a lower height of building or a fewer number of stories or a greater percentage of lot area to be left unoccupied, or otherwise imposes greater restrictions than required by any other statute, bylaw, ordinance or regulation, the provisions of this chapter shall govern. Where the provisions of any other statute, bylaw, ordinance or regulation require a greater width or size of yards or other open spaces or a lower height of building or a fewer number of stories or a greater percentage of lot area to be left unoccupied, or otherwise impose greater restrictions than are required by this chapter, the provisions of such statute, bylaw, ordinance or regulation shall govern. No use shall be permitted which will cause any dissemination whatsoever of toxic or noxious matter outside the building in which the use is conducted. Judging from the thousands of cases involving gas stations around the country, this is not an atypical or unexpected outcome for this use–in fact an entire industry has built up around it, including the company that “remediated” the latest toxic release, American Petroleum. The way I read that clause, the city has justification to shut down all the gas stations in town. But hey, maybe it depends on how one interprets the meaning of “whatsoever.” And, c’mon, let’s be real, we don’t actually mean it when we write in certain codes—it’s an environmental law, for god’s sake. Window dressing. No matter how you slice it, whether through leaking tanks or gas dribbling from a nozzle or gas fumes in the air, a gas station disseminates toxic and noxious matter. There are less problematic locations for gas stations than the middle of the city, and the codes are written to reflect that. Let’s use them, shall we? I find it amazing that suddenly there is such concern about strictly adhering to zoning laws. All the airbnb rentals are still allowed to operate even thought short term rentals and businesses are not allowed in residental areas. The gas station is a functioning business , they are willing to invest ing improving it. I wish there was as much concern about residental areas as there is about the gestalt of Main Street . The Central Main Street zone is a relatively new code, and this is the first time this particular regulation has come up, and the applicant only just went in front of the planning board recently, so to characterize it as “suddenly there is such concern” is misleading. Also, not sure what you mean by “strictly adhering to zoning laws.” That is what they are there for. As for Airbnb, we’ve covered that issue a number of times; I don’t see why you would try to tie it in with the Main Street code. Both deserve equal attention, and the city has spent a significant amount of time dealing with Airbnb type rentals. It’s a new business model, definitely something that many communities large and small are grappling with, and there does not seem to be one easy answer. I would suggest if you are interested in the gestalt of residential areas, you could come to city council meetings and speak out, if you haven’t already. How about a variance for a functioning bathroom instead of a walk in cooler? Just a word of encouragement to those writing about this issue and speaking at the public hearings. Sometimes life doesn’t give you enough time to get involved directly, and at those times I’m thankful for others who are like minded. Keep it up! Who has the final word on this? I spoke tonight at the council meeting and my take was that a gas station on that corner will negatively impact growth of the kind of businesses that are Main Streets’ future. It’s a dead zone, it interrupts the character of Main Street and impedes other business types nearby. 1. exists on the corner of two major thoroughfares. 2. are zoned for business not residential (or civic, like the American Legion building) on all four corners. That narrows the zoning financial incentives down to a handful of corners in Beacon. Any tax loss will be more than made up for by the kind of growth that is seeded and the revenue from that. Just an idea. I told the council there are probably better ideas. And I told the council and mayor I appreciate their work, that they’ve done a lot of good, but two new gas stations within a block and a half on each other is a blot on their legacy. They can still fix it (although, harder to do now, when major business improvements are recent sunk costs). Let’s keep up the drum beats everyone. Someone reading this: please speak at the next council meeting. By “new” gas stations I mean brand new construction. It’s easier to convince a gas station owner, or any business, to sell or change business when it is a decrepit and old business. But when it is brand new construction, like these two gas stations, the owner won’t be as interested to sell or change business, financially or psychologically. Recent sunk costs. And yes, I was only targeting the Fishkill and Main corner gas station with my comments. Only because that’s still being constructed. I’m not saying targeting only one gas station is the best approach, but that seemed to make sense at the time.